For as long as there have been motorised vehicles on earth there have been men the world over racing them and trying to find anyway at all to go faster to beat the competition. Harley-Davidson was competing as early as 1904 and Soichiro Honda was a man obsessed by racing in all its forms and his company has gone on to compete in just about every motorsport event. But motorcyclists seem to be the most creative ones of the motorsport fraternity, from racing on ice, to speedway with no brakes and flying through small towns at 200mph in road racing nothing is off limits. 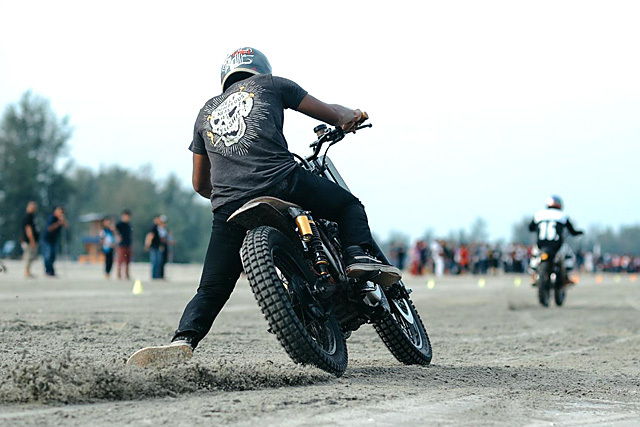 So it makes perfect sense that a group of Malaysian motorcycle enthusiasts decided that the beautiful Balok Beach would be as good a place as any to hold a race. 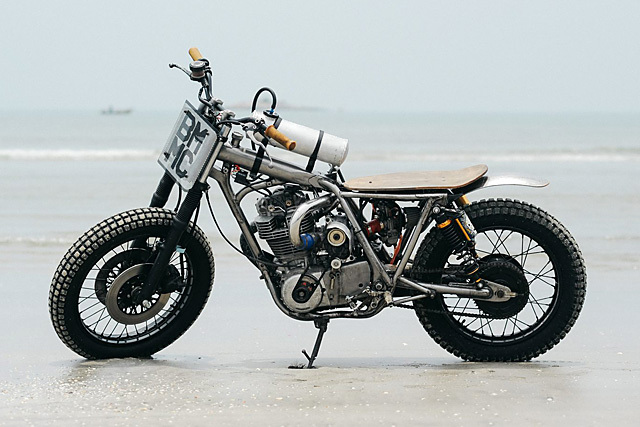 Enter Beautiful Machines and their radical supercharged 1993 Yamaha SR400 built for the sole purpose of taking glory on the sand. 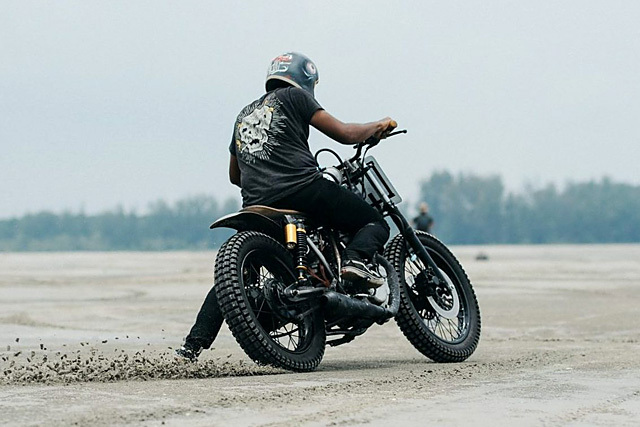 Located in the city of Petaling Jaya just west of Kuala Lumpur, Beautiful Machines have been turning out some pretty trick motorcycles for years now. 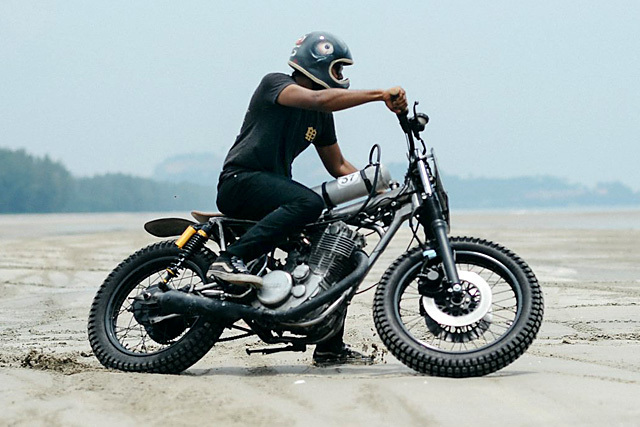 But with a desire to go racing and go further with engine development owner Mr Rajay Singh employed horsepower extractor extraordinaire Irwann Cheng and the SR400 is one of his unique creations. 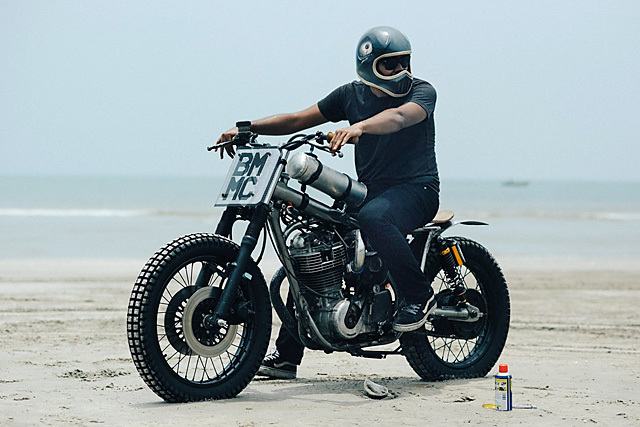 Originally the bike was going to be turned into a custom cafe racer but with the opportunity to head east to Balok Beach and the Rollin Wheelz event it became the workshops race machine and R&D test bed. Rollin Wheelz has four categories Scooter, Prince(250cc and below), King(251cc and above) and Open, with races battled out by two machines that race 200m down the beach, do a U-turn and race back another 200m to the finish line. Starting with an SR meant Beautiful Machines would qualify in both the King and Open class and with the Yamaha’s lightweight giving it an advantage in slowing and taking the single bend, a big focus was placed on getting maximum horsepower from the engine. But before that path was crossed the team knew there was still more kilos to be shed and set about putting the little SR on a strict weight loss program. The whole bike was stripped back to the bare frame and even the paint was removed and it wouldn’t get even a single coat to cover its bones. Without the need to pass a roadworthy check or the sort of comforts you expect on a road bike all the accessories were put in the bin with their brackets and tabs ground off to take more weight off the frame. 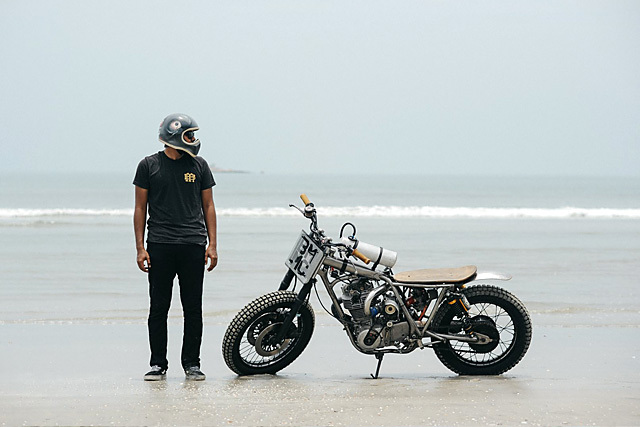 For the look they had in mind Irwann describes the theme “imagining what the bike would be if Mad Max were filmed around beaches instead of the desert.” And with the water so close by the idea was to create a gas tank that resembled a scuba item with the fittings left exposed as if it was a piece that had washed ashore and been put to good use. 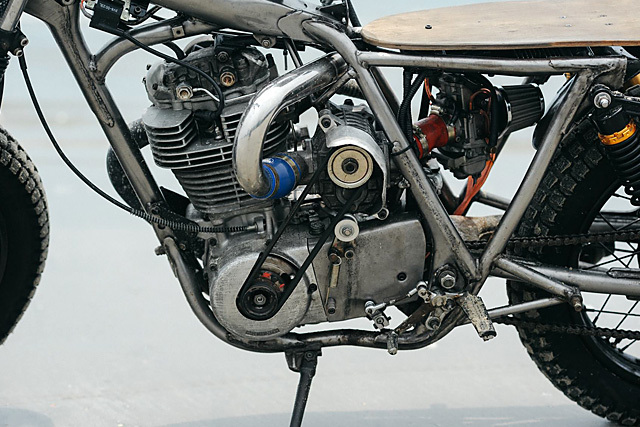 Fabricated in house from aluminium in holds more than enough fuel for plenty of runs down the course while still weighing considerably less than a stock motorcycle tank. The seat was another item Irwann thought they might find on the beach, a raw and ready to roll skateboard deck, as it’s unlikely much diamond stitched leather comes ashore, and once again proves perfect on the weight saving front. 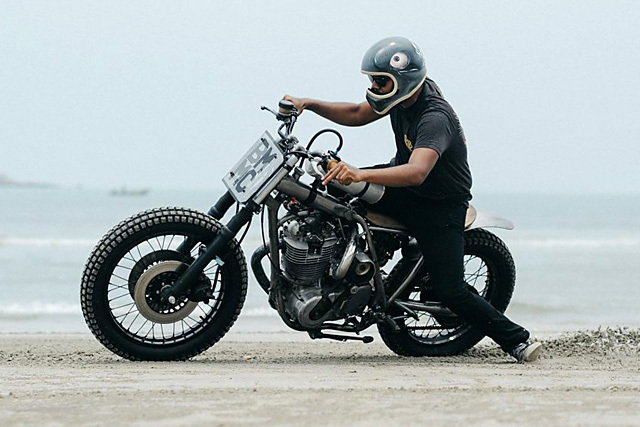 Like a dirt tracker there is no need for a front fender but to tame the biggest of the sand filled rooster tails a clear lacquered fender in generous proportions was bolted to the back of the bike. It also extends down enough toward the front of the rear tyre to prevent any sand being sucked into the carbs intake that is now placed considerably further back due to the supercharger. With all the lighting gone the front end now wears a race plate fabricated from perforated aluminium that is affixed to the forks and wears the Beautiful Machines Motorcycle Club logo to let their competitors know just who they are up against. But when your single cylinder Yamaha is packing a supercharger that is on full display for all to see there is probably no need to identify oneself in any other way. Before the blower could be bolted on Irwann spent considerable time and effort ensuring the little 399cc, two valve engine could cope with the increased cylinder pressure and flow requirements. First on the list of changes was to the cylinder head and ensuring all that extra air could make its way in and out of the engine. A full port and polish was performed as well as opening up the passages in the head to ensure there were no restrictions to gas flow. Matching a camshaft to the requirements of forced induction was never going to be an off the shelf proposition for the SR and so instead Beautiful Machines ran the numbers before machining the stock item to have longer duration and increased overlap. Now that all the air was capable of getting into the engine through the head the bottom end needed to be able to cope with the bigger bang. Irwin swapped out the standard piston for a Wiseco forged unit and along with a thicker head gasket brings compression down to a more boost friendly 8.0:1. Feeding the fire starts with the big Keihin FCR-MX carburettor that ensures even at high rpm there is never any danger of running lean and grenading the engine. The supercharger itself is an Aisin AMR300 that pulls the fuel mix through the carb along a Samco silicon tube chosen for its ability to resist heat. Then Irwann had to squeeze the blower into that compact space “For the supercharger mounting, it’s all made in house. I used steel rods and machined bushings for the mounting. Next, I mounted the drive pulley at the flywheel and then machined the flywheel back to its original weight, while the belt is given tension and guided by a tensioner made in house.” Having spent six years previously with his head in the books Irwann put to good use what he’d learnt calculating the exact volume and shape of the plenum chamber to avoid the negative consequences of the pulsing effect. Along with the inlet tract it was fabricated from stainless steel, while on the exhaust side the stock header pipe proved capable of providing enough flow once fitted up with a less restrictive megaphone muffler. Now that the SR had plenty of power to get off the line and down the straights Irwann had to turn his attention to getting it slowed down and around that all important U-turn at the halfway mark of the race. With the stock Yamaha under braked the move was made to a full Suzuki GS550 front end with its twin disc setup allowing for good feel through the lever to also ensure the front is not lost when braking on the soft sand. The bigger forks help improve the handling and a set of gaiters are more than just for show and protect the seals from the fine particles. The rear shocks have been replaced as well, with coil over progressive rate springs on fully adjustable shocks to help set the bike up for what can be totally varying conditions of grip. Front and rear wear spoked rims, 19in at the front and an 18in at the rear, with both wrapped in Shinko Trail Tyres. Taking care of the steering duties are lightweight Renthal bars and a pair of quality Biltwell grips. With the bike finished the team packed up and headed for the Rollin Wheelz event having spent considerable time ensuring the engine was perfectly tuned. Unfortunately in the King class a faulty coil failed and let the team down, so any success would have to come in the highly competitive open class, with some bikes packing more than three times the SR’s capacity. The first two rounds were a success with the blown SR smashing the opposition with lethal acceleration; however trouble in the turn saw a loss in the third round. But Irwann doesn’t blame the bike and new to race riding duties he knows next year they’ll be back better than ever and the Beautiful Machines Supercharged SR will give the competition a hell of a run, they might be giving away a huge amount in cubic capacity but sometimes boost is best!